Nutritional supplement for skin & coat. Recommended as a high potency nutritional supplement, which aids in correcting nutritional deficiencies and for maintenance of a beautiful skin and coat condition. Improvements are seen within 2 weeks of use. 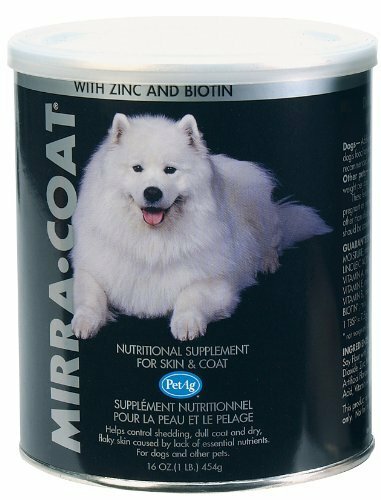 Mirra-Coat contains the following: Balanced Omega 6 & Omega 3 Essential Fatty Acids (EFA) – promotes cell membrane and nerve cell formation – improves skin barrier function. Both linoleic and linolenic acid. Optimal Organic oils (pesticide and solvent free). High levels of natural antioxidants and vitamins. Vitamin E complex (tocopherol and tocotrienol) which prevents cellular oxidation, balances vitamin A concentration and activates EFA metabolism. Vitamin A prevents plugged hair follicles. Vitamin B6 prevents dermatitis and hair loss and activates EFA and protein metabolism. No Vitamin D – excess vitamin D causes bone dysfunction – excess vitamin D causes soft tissue calcification. Zinc – prevents scaly dermatitis and hair lossactivates EFA and protein enzyme systems. Biotin – prevents scaly dermatitis and hair loss – improves hair color and luster – activates EFA and protein metabolism. High level of octocosanol, a potent energy source. Gamma-oryzanol for improved growth and better blood circulation. If you have any questions about this product by Mirra-Coat, contact us by completing and submitting the form below. If you are looking for a specif part number, please include it with your message.